The Shiverpeaks pose a danger to all those that dare to make their way through it. Adventurers are never truly safe here unless they can find shelter within a Dwarven outpost. This might seem to be a “no-brainer”, but I have heard of some stories of fools wandering into the wrong Dwarven camp! Stone Summit and Deldrimor Dwarves treat humans completely different. As I mentioned earlier in the Northern Shiverpeaks, the Stone Summit hate all other races. They even hate their own brethren, the Deldrimor Dwarves, because they interact with humans. Preparing for a long and exhausting journey ahead of me, I asked a few friends (and guild members) to accompany me into Talus Chute. And so Bonke, Forbidden V., and Adi joined my party. It’s so nice to finally be in the Southern Shiverpeaks, The Crystal Desert is not the worst place to visit, but I prefer cooler weather. 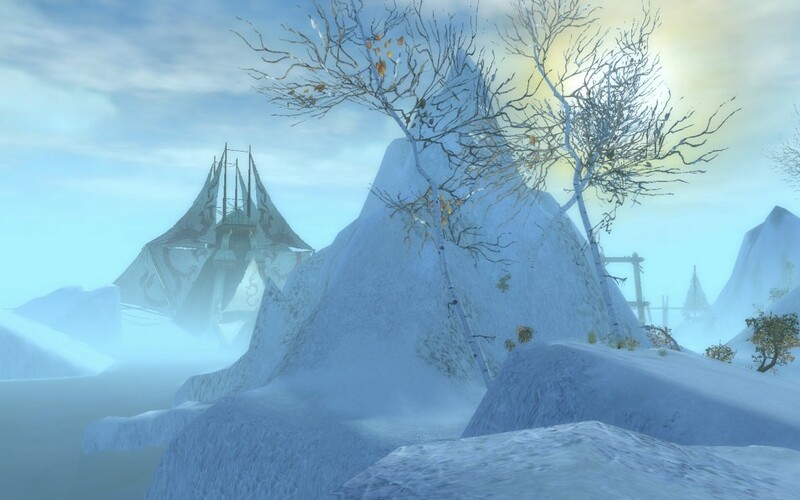 I left from the busy shipping outpost of Port Sledge to explore Witman’s Folly with my good friend Erolin and three new friends: Bonke the Paragon, Akela the Elementalist, and Nijntje the Dervish. Whitman’s Folly may even be a tribute to Marshall Whitman (although they left an H out). Along with his friend Marshall Tasca, they are known as legendary explorers of Tyria. I’ve even heard rumors that you can still find M. Whitman deep within Sorrow’s Furnace. Unfortunately, it is well known that M. Tasca is dead though.